Eye protection is an important type of measure in the context of laser safety, as the eyes are particularly sensitive to laser radiation and at the same time particularly important. Different kinds of laser radiation can cause different types of damage. Most important is damage of the retina as most often caused by excessive irradiation in the visible or near-infrared spectral range, but there can also be damage of the cornea or the lens caused by mid-infrared light (causing overheating) or ultraviolet light (causing cataracts of the eye's lens). 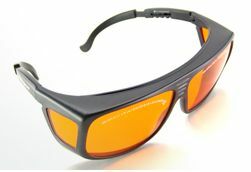 Figure 1: Laser safety goggles with orange filter glass and fitover frame. The image was kindly provided by Laserglow. Different kinds of eye protection are required when working with dangerous light sources. A first approach should target the source, preventing dangerous beams from hitting the face in the first place. However, this may often not be achieved with the required certainty. Therefore, it is often necessary to use additional eye protection with special kinds of laser safety glasses (Figure 1; also called safety goggles). These can contain absorbing optical filters and/or multilayer structures (dielectric coatings) which operate as Bragg mirrors for certain wavelengths. In experiments with visible laser beams of different colors it can be difficult to obtain simultaneously strong attenuation at all lasers' wavelengths and high enough transmission at other visible wavelengths. Therefore, different types of safety glasses have been developed for different circumstances. For moderate optical power levels, lightweight goggles with plastic filters can be used. These are made of, e.g., a polycarbonate with a dye mixed into the material, or with an absorbing or reflecting coating. For higher powers, real glasses are usually preferred. These can be more robust against laser light and also against abrasion (but less so against mechanical shock), apart from offering better visible light transmission. There are also combination products, containing a lamination of filter glass and polymer layers. Special coatings help to prevent a filter from totally falling apart when the glass is cracked under the influence of high-intensity light. Apart from the filter glass or plastics, the housing is also important, as it influences the protection against beams coming from the side or the rear, but also the ease of wearing, the field of view, the tendency for fogging, the possibility of wearing prescription glasses below, etc. The multiple trade-offs show that it is important to select carefully eye protection which is suitable under the given conditions. One has to take into account not only the properties of the lasers involved, but also various other aspects of the work environment.